Round Cafeteria Table 60" dia. 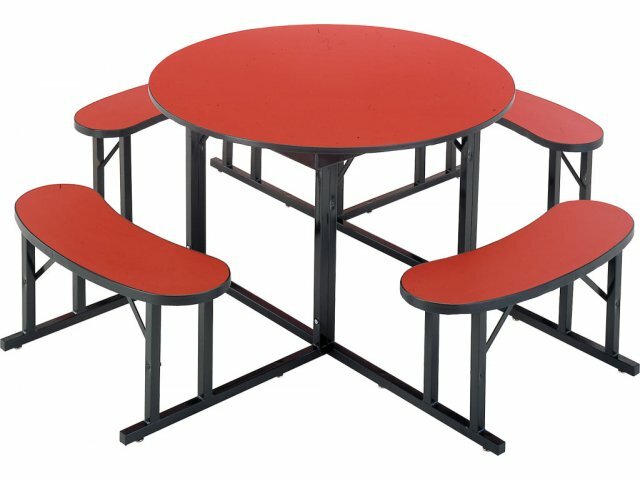 Shown: 4-6 seater round cafeteria table. This model seats 6-8. Many Sizes - and Hundreds of Cool Color Combinations! Integrated tabletop bench design maintains a neat, clean look. Perfect for any school. Barricks' high quality products have been pleasing customers for over 50 years. 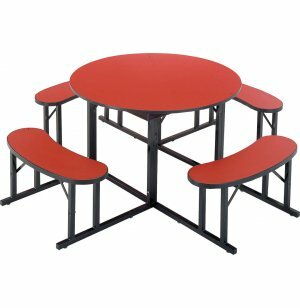 From preschool bench units to cafeteria tables to seminar training tables, Barricks products can be found everywhere from daycare facilities to universities to corporate conference rooms. Baked enamel is an economical, wear-resistant type of paint finish. Tops and benches are finished with High-Pressure Laminate and backer sheet. 2 1/2" semi-boxed steel apron for added strength. Benches have a 700-lb. static weight capacity. You can mix and match tabletop and bench colors when ordering more than one table. NOTE: Cafeteria Tables are Custom Orders and Therefore are Non-Returnable.